With the death of William Hutt, Canada lost its greatest Lear. Brian Bedford played Lear in 2007 and as did Christopher Plummer in 2002, but neither actor was interested in giving his all to the mad scenes. Now with Colm Feore’s Lear we have an actor who is so interested in the mad scenes his Lear goes mad within ten minutes of his first appearance. Under a director with a clear vision, Feore likely could make a compelling Lear, but director Antoni Cimolino’s vision is fuzzy and he does nothing to rein Feore in when he needs to. Cimolino’s first mistake as a director is his attempt to make King Lear about a contemporary issue rather than exploring the eternal questions the play poses. Cimolino begins the action by having a guard clear the playing area of a small group of beggars or homeless people. The same happens at the castles of Goneril and Gloucester. The final image of the play is Edgar reaching out a hand to these same people. In his “Director’s Notes”, Cimolino says of King Lear, “With its criticism of religion, economic justice and the monarchy, it would have been a sure ticket to the Tower of London”. The first and third claims are ridiculous. Read closely, the text balances statements saying the gods (always plural) are uncaring (“As flies to wanton boys, are we to the gods”) versus ones saying they are caring (“Upon such sacrifices, my Cordelia, The gods themselves throw incense”). The play does not criticize the monarchy. Rather it criticizes the division of the kingdom. As for “economic justice”, by which I assume Cimolino actually means “economic injustice”, the irony behind Lear’s empathy with “Poor Tom” is that “Poor Tom” is actually the nobleman Edgar in disguise. The prime example of homelessness is Lear himself who is refused shelter by Goneril and Regan. There is no need for Cimolino’s added characters and to have Edgar reach out a helping hand to them sentimentalizes one of Shakespeare’s least sentimental plays. Cimolino is unsubtle in a more technical area. He seems to think that people express anger only by shouting when icy coolness is often more disturbing. The result is that most of the actors in principal roles go hoarse at sometime during the play which must be as tough on them as it is on the audience. An unmodulated voice is inexpressive so that the poetry of many of the play’s most important exchanges goes missing when Lear, Goneril, Regan, Gloucester, Kent and Albany are all shouting. The worst example is Colm Feore’s Lear. He flies into such a high pitch of rage at Cordelia in his very first scene, he leaves himself nowhere else to go. The result is that his madness, also expressed by shouting, is no different from his previous anger. Since shouting causes Feore to go hoarse every time, one wonders how he can keep his voice till the end of the show, let alone during the play’s run into October. As it is with the shouting so it is with the storm. The first scene after intermission is Act 3, Scene 2. Cimolino asks for such a racket of thunder and lightning from sound designer Thomas Ryder Payne, that you can hear Lear’s famous line,”Blow, winds, and crack your cheeks!” but little else. You can hardly see Feore anyway because of the torrent of stage fog pouring down from the balcony making it look as if Lear is delivering his speech from behind Niagara Falls. When Cimolino allows the sound effects to cease and the actors to speak in more natural tones, the scenes are stronger. The three best scenes in the play are the mad Lear’s encounter with the blinded Gloucester (Scott Wentworth), the Dover cliff scene between Edgar (Evan Buliung) and Gloucester and the not-yet-mad Lear’s scene with his Fool (Stephen Ouimette). The quality of the acting is very uneven, with bad performances undermining the effect of good ones. Everyone will focus, of course, on Colm Feore. He speaks verse as clearly as ever as long as his voice holds out, but in a role that requires such an enormous emotional arc, it is dismaying that he should go so big so soon with the result that his later outbursts appear simply as repetitions of the first. In the latter part of the play when Lear’s raging is over, Feore is so intent on showing us Lear as a pitiable creature, all his moaning, whining and weeping begin to seem self-indulgent. Feore loses sight of the fact that Lear projects a sense of “authority”, as Kent calls it, even when he is no longer king. 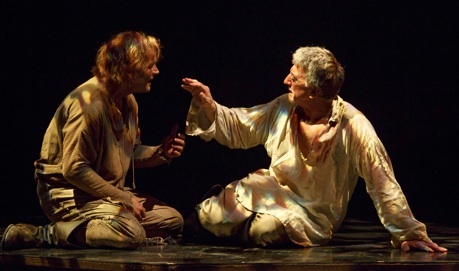 As Gloucester, Scott Wentworth, in contrast, takes a journey parallel to Lear’s from pride to ignominy with greater restraint and is subsequently more effective. The revelation of the evening, however, is Stephen Ouimette as the Fool. Never have the Fool’s lines been spoken so clearly and made so much sense. Too often the Fool’s lines come off as so much nonsense. Ouimette, however, conveys the meaning of every line and, as we see, every line is a barb aimed at Lear to remind him of his folly in rejecting Cordelia. Ouimette is so self-effacing that we hardly notice when the Fool disappears. What we do know is that his absence has made the world of the play a lesser place. Cimolino has the bizarre idea of presenting Gloucester’s good son Edgar as lewd and drunken when we first see him. Perhaps Cimolino means to make Edgar’s life as Poor Tom more of a learning experience, but it is that already and it hardly suits the moralist that Edgar becomes. Throughout the play Edgar tries to find a concise message in the chaos he sees but his summations are always inadequate. In any case, Evan Buliung gives a superior performance and shows well how Edgar’s maintaining his disguise as Poor Tom in Gloucester’s presence becomes an almost unbearable strain. Buliung conveys a wonderful sense of resignation and sadness in his description of his father’s death. One of the best features of Cimolino’s direction is how he distinguishes Goneril and Regan. In their scene together after Lear has divided the kingdom, Liisa Repo-Martell’s Regan is clearly resentful and takes the throne as if already yearning for revenge. Maev Beaty’s Goneril, however, is still approaching their new situation with reason and even when turning Lear and his hundred knights out of her house is attempting to be reasonable. As soon as Edmund enters the scene, she covets him and rebels against her husband and all authority. Both Repo-Martell and Beaty play the sisters as icy, but Repo-Martell’s Regan is more impulsive and Beaty’s Goneril more calculating. There is something about Mike Shara’s body language as the Duke of Cornwall that tell us he is dangerous before he even utters a word. As we soon see Shara plays him as a psychopath whose primary pleasure is inflicting pain and is thus well matched with Repo-Martell’s Regan. Michael Blake is excellent at showing us the Duke of Albany’s growing revulsion against the deeds of his wife and sister-in-law. Unfortunately, other roles are not so well conceived. Sara Farb acts Cordelia with so little inflection she might as well be reading out recipe cards. Brad Hodder has been misdirected to play Edmund’s first scenes as if they were funny. Yet, even when Cimolino realizes Edmund must be taken seriously, Hodder cannot muster up anything resembling menace. As Kent, Jonathan Goad is also misdirected to play the role for comedy. Only when Kent is put in the stocks does Goad try to make a transition to earnestness but, speaking verse as prose, never summons a convincing gravitas. Fans of Feore will of course want to see him as Lear. Fans of the play, however, will find that Cimolino has no new insights to offer. Instead he tries to make the play moralistic and sentimental when that is precisely what Shakespeare avoids by giving Cordelia such as senseless death. King Lear is clearly a play so dark even some directors can’t face it as it is. Photos: (from top) Stephen Ouimette as the Fool and Colm Feore as King Lear; Evan Buliung as Edgar and Scott Wentworth as Gloucester. ©2014 David Hou.